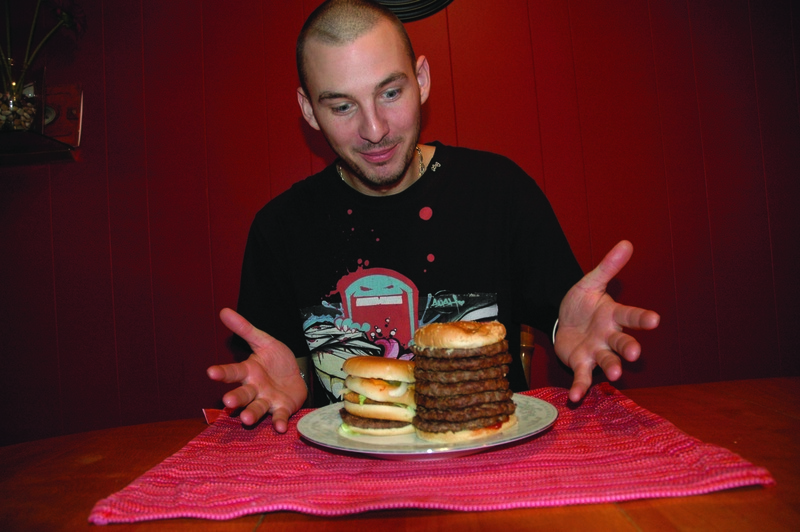 Keith Bottenfield doesn't know to do with these monster burgers. I wasn’t sure how to approach the drive-thru cashier at the Sahali McDonalds to order the raunchy-named burger, the McGangbang. Luckily, the cashier looked to be maybe 15, so I ‘ballsed up’ and ordered the burger as politely as I could. Rolling into the drive-thru below the golden arches, I was skeptical of the McGangbang—a junior chicken patty shoved between two patties of a double cheeseburger. Add to it pickles, mustard, ketchup, spicy sauce, four pieces of bread, two slices of cheese, and you have yourself a whole lot of burger. Without questioning or even cracking up, he started punching my order into his computer. It was so efficient that I had to ask if there was a button that said McGangbang in his fancy, touch-screen computer. There wasn’t—he punched it in separately as a junior chicken and a double cheeseburger like he had for the many clowns who ordered it before me. No, I did not want fries with my burger. The McGangbang appears nowhere on the menu, but the cashier knew exactly what it was when I ordered it. Not that I expected a commercial featuring Ronald McDonald with his goofy red grin hyping the McGangbang, but how exactly did this become popular? You look at A&W, with its five-to-seven patty animal burger, but it really doesn’t translate. Now KFC is out with the double down burger. Competing with ridiculous burgers around, it is essentially two chicken patties made like the bun of a burger. I went to try it, but it was sold out in both Kamloops locations. These fetish burgers remind me of Disney movies containing sexual references, and it creeps me out—happy cartoon characters selling happy meals to children while secretly selling McGangbangs off the record and off the menu. As if fast food companies don’t have enough leverage with their greasy, fatty, salty, sweet, all-but-healthy-for-you qualities that are so tasty and tempting, they are now going above and beyond to market their products in novel ways. Nonetheless, I bow down. The McGangbang is decent taste-wise. It’s a little large, and a little off on the bread-to-sauce ratio, but it could potentially be the new hangover-cure. I recommend squishing it down a bit before attempting to fit it all in your mouth. McGangbangs are just over $3, but smiles are free at McDonalds.